New members of the Emory Sports Hall of Fame include Mike Phillips, Mary Ellen Gordon and Annie Schenck. Photo by Mandy Wakefield. 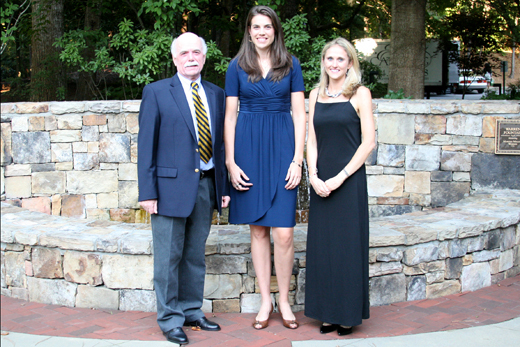 The Emory Sports Hall of Fame added three new members to its ranks Saturday evening in a ceremony conducted at the Miller-Ward Alumni House. Recognized for their contributions to Emory athletics were former coach and administrator Mike Phillips, former tennis All-American and NCAA Singles and Doubles Champion Mary Ellen Gordon and former women’s soccer All-American Annie Schenck. Serving in a number of different capacities over a memorable 35-year career at Emory University, Phillips touched and influenced the lives of countless students and colleagues. He was the first head coach of the Emory golf program, a position he held from 1983 through 2011. Under his guidance, the Eagles made 16 NCAA Championships appearances and managed six top-10 finishes. He coached Emory to 13 UAA titles and was selected as the conference coach of the year on 10 occasions. As a member of the Emory women’s tennis team, Gordon finished off her career as the most decorated player in her sport in NCAA history in any division. She captured the NCAA Division III Singles Championship twice and was a four-time national doubles titlist, becoming the first player in NCAA history, man or woman, to win the doubles crown all four years. The first female in UAA history to receive the MVP award every season, she closed out her career in the No. 1 spot on Emory’s all-time list with 115 singles wins and 104 doubles victories. Schenck played for the Emory women’s soccer team from 1999 through 2002 and was the first player in the history of the program to earn back-to-back First Team All-America honors. A dynamic offensive performer, she was the team’s leading scorer in each of her first three seasons and remains the Eagles’ all-time leader in points, goals and game-winning goals. Her efforts helped Emory to a four-year record of 57-9-11 that included two NCAA Tournament appearances. The Emory Sports Hall of Fame now stands at 161 members. More information on the new inductees is available here.